Smoky flavors bring to mind images of campfires and cavemen — times when nature was an essential part of the cooking process. New York City bar The Wayland serves up an applewood-smoke-infused cocktail with a name that says it all: I Hear Banjos. That’ll happen with smoke-infused food. And when it’s done right, you will certainly be game for an encore. Smoking is a slow cooking process in which wood smoke is used to indirectly heat foods at a lower temperature. As barbecue has become ever more in vogue, smoky flavors have been popping up in a wide range of dishes, from standard slow-cooked meats to more unusual dishes like cheesecake, smoked pecan sticky buns and bread pudding with smoked cherries. Restaurant News has named smoking a trend to watch out for this summer (though the technique has been popular for much longer). If playing with fire isn’t your thing, you don’t have to delve too deep into the smoking process to add a touch of woodsy flavor to your food. Manning lists three ingredients to keep in your smoky arsenal: liquid smoke, smoked paprika and adobo sauce. Purists may scoff at liquid smoke, but it will do the trick for those short on time. Add just a drop or two (it’s very strong) to meats, drinks, guacamole and barbecue sauces. Or, if you’re a fan, sprinkle smoked paprika on dishes that typically call for the spice to bring out a subtle mesquite flavor. Manning recommends making a basic adobo sauce to use in any sort of ground meat mixture for smoky hamburgers. You can also infuse smoky flavor in meat and vegetable dishes is by using smoked salts and coffee-laced rubs. Barbecue master Tim Byres of SMOKE restaurant in Dallas, Texas, makes an ash salsa (recipe below) that brings out smoky flavors in its tomatoes (but without calling for actual smoking). When it comes to smoky drinks, Byres says the key is what he calls “sun tea.” Just take small maple wood or cedar planks and mix them in glass jars with bourbon or whisky, then let them sit and stew in the window. You can add sun tea to other drinks, like margaritas, to add a dash of smoke to sweet cocktails. Don’t forget to poke four to five holes in the foil to allow smoke to escape, he warns. If smoke sits around too long, it will deposit minute particles on your food, giving it a funky flavor. “To properly smoke you want good air flow to constantly bring fresh smoke in contact with your food and remove the old, stale smoke,” he said. Kettle-style grills like the traditional Weber can also be used for smoking. Simply place lit charcoal around the grill and your food in the middle. Then put water-soaked wood chips on the hot coals, he says. Experimentation is strongly encouraged: His recipe for smoked tomatoes (below) can be incorporated into many other dishes, like cream of tomato soup or a summery pasta salad. Last, but certainly not least, we come to dessert. At Spot Dessert Bar in New York City, chef Ian Kittichai invented a smoked cheesecake inspired by a special incense candle called “tien op” that is used to smoke coconut milk and certain Thai desserts. The process is simple, requiring only the candle and a couple of bowls. Courtesy of Tim Byres, "Smoke: New Firewood Cooking"
Prepare coals and a grill for direct-heat cooking. Place the toasted chipotles in a medium bowl and set aside. 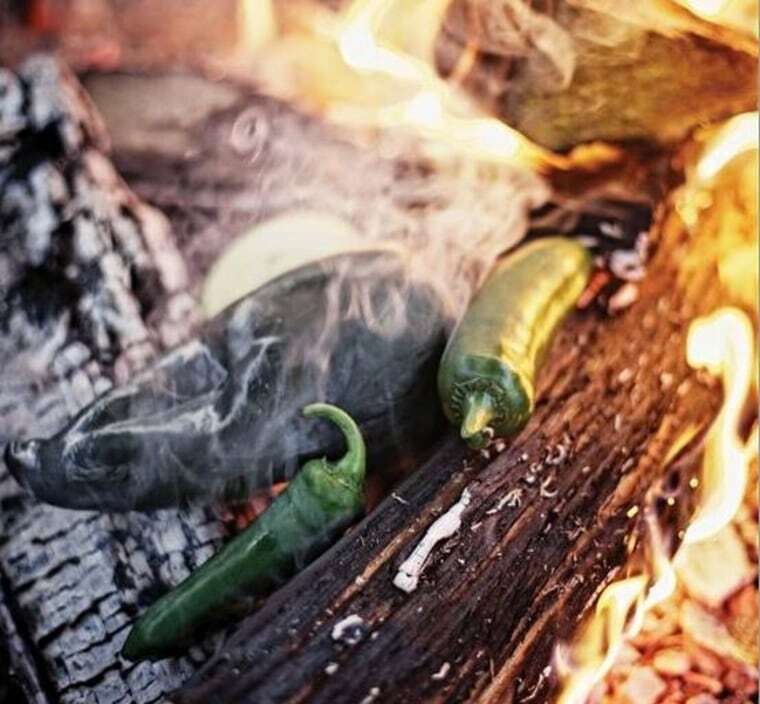 Nestle the onion, jalapenos, and poblano directly into the hot coals of the fire. Cook the onion and chiles for 5 to 10 minutes, until blistered and blackened, then turn and continue to cook until the other sides are black. The peppers will blister and turn black before the onion does, so remove those first. Place the tomatillos and tomatoes on the grill over a blazing fire and cook for 3 to 5 minutes, until the skins are partly charred. The tomatoes are delicate, so use tongs to turn them so that all sides get some char. Cook the tomatillos and tomatoes on the grill at the same time as you cook the onion and peppers in the coals, turning them both as needed. While the tomatillos and tomatoes are on the grill, make a packet out of foil and place the garlic, oil, and ¼ teaspoon salt into the packet. Place the garlic packet either directly in the coals or on the grill and roast for 5 minutes. Transfer blackened vegetables to the bowl of chipotles and cover with plastic wrap. When the vegetables are cool enough to handle, remove the stems from the chiles and cut the root end off of the onion, discarding the stems and root end. Place the vegetables, the roasted garlic, and the cilantro, cumin, coriander, and remaining 1 ½ teaspoons salt in a blender. Puree on medium speed until smooth. The salsa may be refrigerated in an airtight container for up to 3 days. In a large glass container with a lid, submerge the wood in the spirit and allow it to soak for 2 days. If you are making this with tequila, use the cedar wood; if with bourbon, the maple. When you are ready to use, pass the spirit through a fine-mesh strainer and reserve in clean and dry jars. You can drink this straight or use in mixed drinks. Combine all the ingredients in a large pitcher and stir well. Pour into glasses filled with ice and garnish each with a thin slice of lime. 1. Place a Thai incense candle in a 3–inch-wide bowl; place within a larger bowl containing cheese. Light candle; cover bowl with foil. Smoke for 30 minutes. Uncover bowl; set aside. 2. Heat oven to 300 degrees. Mix crumbs and butter in a bowl; press into bottom of a 9-inch springform pan wrapped in foil. Bake until set, about 15 minutes; cool. Process cheese and sugar in a food processor until smooth. Add 1 cup cream, salt, vanilla, eggs and yolk; process until smooth. Pour cream cheese custard over cooled crust; bake until cheesecake jiggles slightly in center, about 1 hour, 15 minutes. Cool, and chill for 4 hours. 3. Whisk remaining cream, coconut milk, and confectioners' sugar until stiff peaks form; spread over cake. Sprinkle with chocolate to garnish. Take 1 cup of wood chips (use your favorite kind-do not use wood from treated lumber as it often contains aresnic and other dangerous chemicals) and soak them in enough water to cover. Soak 1 hour. Light approximately 15 to 20 charcoal briquettes. I prefer to use a chimney starter as opposed to lighter fluid. Allow to burn down until covered with a layer of gray ash. Place in your grill, in two small piles on each side. Meanwhile prepare 12 to 15 tomatoes by removing the core and cutting a shallow "X" on on the blossom end. Drain the wood chips and divide among 4 sheets of aluminum foil that you have cut into 6 x 6-inch squares. Fold up the bundles leaving an opening about 1-inch wide. Place a bundle on each pile of coals. Place the grill rack on the grill and arrange the tomatoes, on the rack, in the center. Make sure the tomatoes are not touching or sitting directly over the piles of charcoal. Cover the grill and adjust the top damper to about half way open and smoke for 15 minutes. Replace the wood bundles and continue to smoke for another 15 to 20 minutes.